This Summit-series Weber grill is fully loaded with virtually every feature you can think of. Four main burners are supplemented with a side burner, infrared rotisserie burner, dedicated sear burner and a smoker box with its own smoker burner. All in all, this grill has eight burners on it and eight (lighted) control knobs. The only Weber with more is the six-burner version. Weber provides an excellent warranty and support, so you'll get a good 10 years out of this grill. 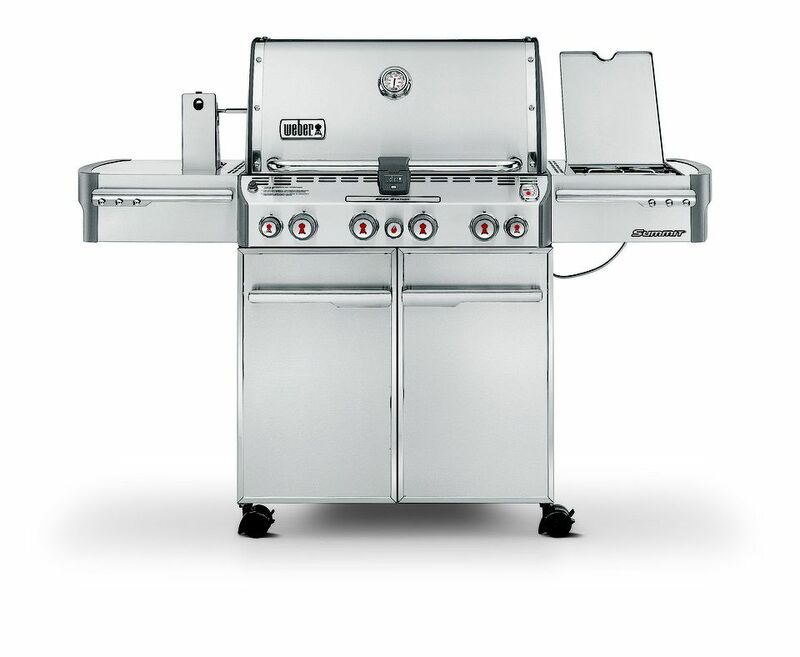 The Summit line of gas grills represents the best of what Weber has to offer. This, the smallest of the Summit line, is an attractive and capable gas grill. What you get for around $1,900 on Amazon (as of Feb. 2018) is a four-burner, 48,800-BTU gas grill with a 12,000-BTU side burner, 8,000-BTU smoker box burner, 10,600-BTU sear burner and full rotisserie system including a rear-mounted 10,600-BTU infrared rotisserie burner. Weber makes grills that produce great heat for less fuel and provide a professional level of even heat in cooking. This unit will do pretty much everything you would want a gas grill to do (rotisserie kit optional), from searing a steak to indirectly cooking a turkey. This unit comes with a handle-mounted, battery-powered grill light that seems to be more gimmick that practical. If you want a light that will tell you where the chops are, this will do the job. If you need a light that will show you the color on shrimp, you might be a little hard pressed to see that with this light. It's a cute feature, and the only real gimmick to this grill. This grill features Weber's tuck-away rotisserie kit that puts the motor on a drop-down platform built into the side table and gives you a place to store the rod and forks in the cabinet. All in all, this is a great grill. Even people who don't like Weber as a company have trouble complaining about this one. If you are serious about grilling and want a great grill that will last you a long time, then this is the unit for you. While you pay for the Weber name, they are the only company that will give you 24/7 support 364 days a year. They also have a great reputation for service. This grill is also available in a natural gas version.